We all love a car vs bike challenge. Not only does the video generate a huge amount of interest, but it also separates bike lovers from car lovers and even those in-between, like myself. We all know Superbikes are fast, but we all want to know just how fast exactly? Most of us will know that a Superbike can outrun almost anything on the straights, but what about the corners? After all 4 wheels are better than 2 when it comes to cornering and braking. The problem is some of these videos are skewed or scripted, thanks to those of a bias disposition, *Ahem Jeremy Clarkson. We can’t exactly use his Top Gear bike vs car battles as a reference because the Top Gear test track is almost as tight as a Kart circuit. 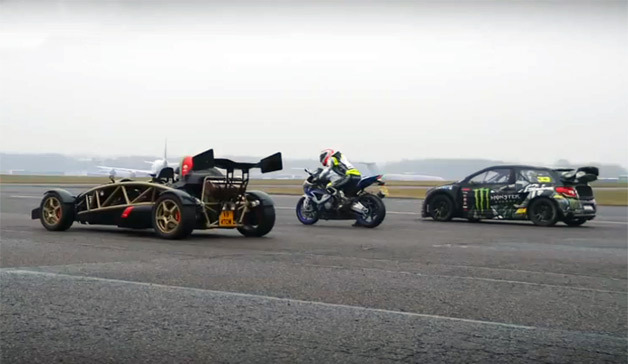 Not to mention the first race they did when they placed a stock 600cc Honda, ridden by an enthusiast, up against the insane Ariel Atom, driven by the Stig. That was about as fair as a Zimbabwean election. In the second challenge they upped the stakes with a 1000cc superbike, but the race was more scripted than an episode of the Walking Dead. This is because of how extremely dangerous it can be placing a superbike and car on the same track at the same time. So here are some videos that depict exactly how fast a superbike is, when given a more equal playing field.